GERING & LóPEZ GALLERY is pleased to present Crossroads, a solo exhibition of recent works by New York based artist Matthew McCaslin. 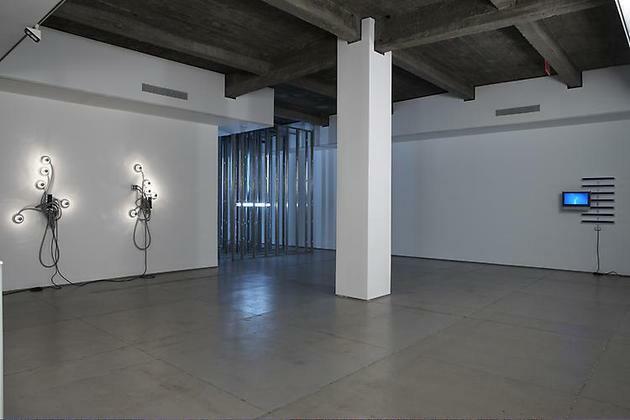 Known for his installation and video work grounded in industrial materials, McCaslin continues to explore the dualistic nature of physical and metaphysical space, and the point at which the two converge. He juxtaposes the organic form of the human body against the synthetic materials of modern industry in a diverse and playful mixture of installation and object to craft mystery and beauty. By transforming mundane materials into aesthetic objects, McCaslin produces the experience of the sublime contained within the gallery context. 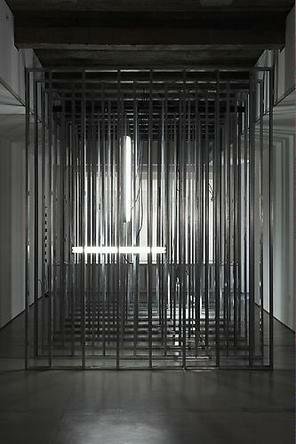 Inside Out, a large installation dominating half of the gallery space, is composed of a field of metal studs arranged to reveal a semi-transparent structure. Four fluorescent light fixtures hang both vertically and horizontally at different heights and depths within the large cube. 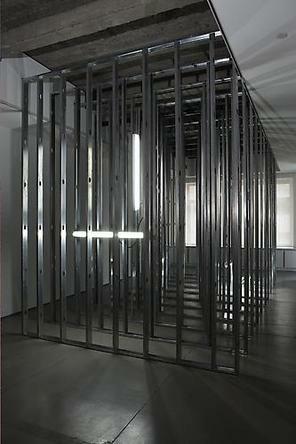 As the viewer walks through the piece, she experiences the absence of human presence within the incomplete structure. The partially lit utilitarian materials create the mysterious impression of an ominous power source fueled by the electric potentiality of industry. 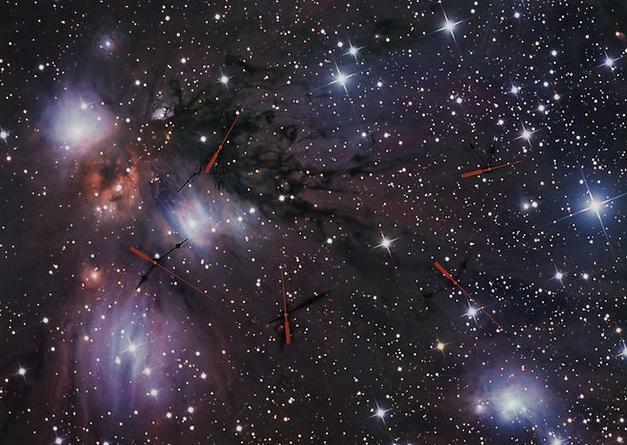 Additionally, there are two photo-based wall reliefs comprised of digital prints of deep space nebulae affixed with mixed media objects including audibly ticking clock hands and chewing gum. 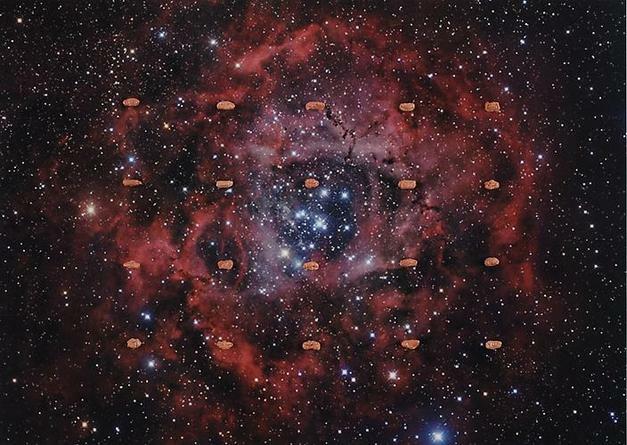 The combination of ordinary, functional items with images of outer space reinforces the idea of the frivolity of daily life within the greater cosmos. 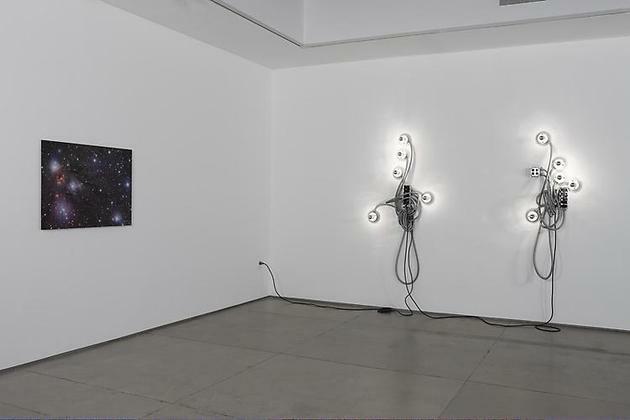 McCaslin has also created a sculptural light piece consisting of fluorescent black light bulbs and a flat-screen TV that plays a video of slowed lightning footage. 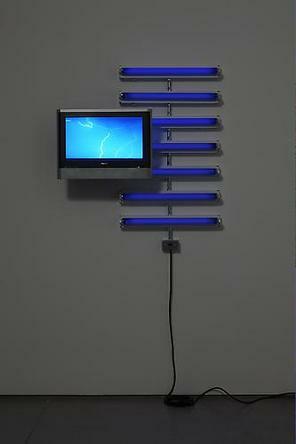 The black lights generate an electrically charged atmosphere in the gallery while the television suggests the viewer is watching the storm from a window. 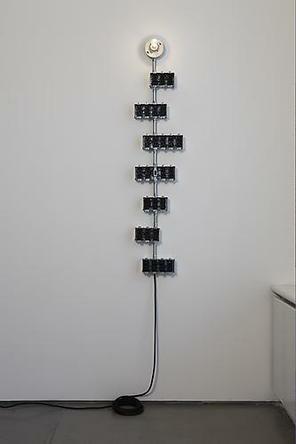 Lastly, McCaslin includes two of his signature totemic light sculptures. 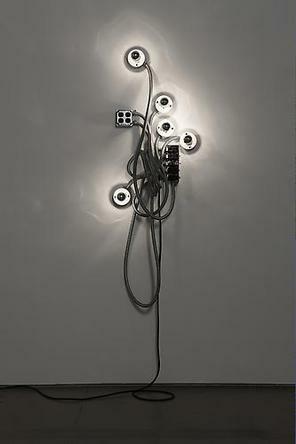 Sharing the title He or She, the pair is connected both visually and electrically by a single black cord. 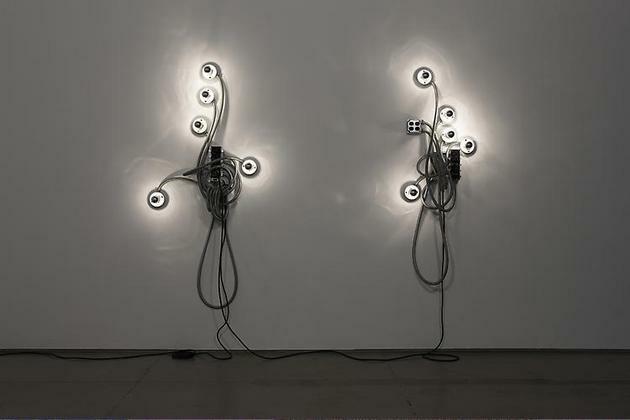 Both are made of flexible, metal electrical cables, porcelain light fixtures, light bulbs, and receptacle boxes with a switch that turns the pieces on and off. 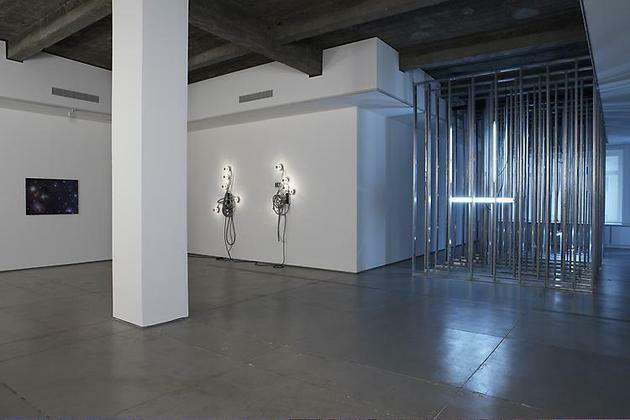 When lit, the mirrored incandescent light bulbs reflect against the wall, adding an ethereal dimension to the sculptures. 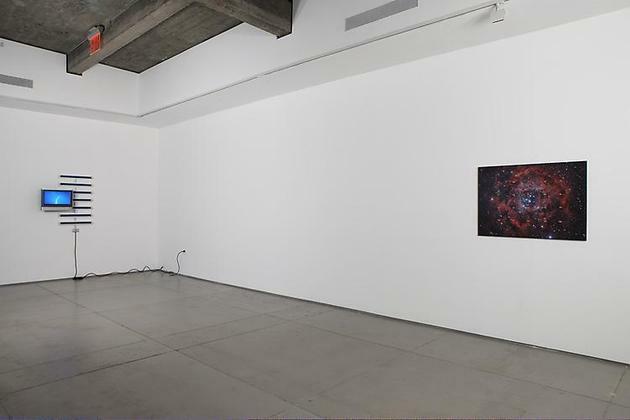 In these pieces, McCaslin explores the multiple facets of interconnectivity, uniting his objects both physically and through a less tangible force of energy as naturally occurs in human interactions and power dynamics. Matthew McCaslin was born in Bayshore, NY in 1957 and currently lives and works in Brooklyn, NY. 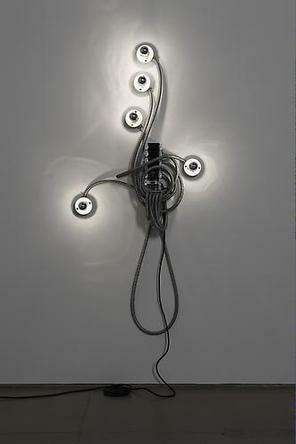 He received his BFA from the Parsons School of Design, New York, NY in 1980. His work is in many international public collections including the Los Angeles Museum of Contemporary Art, Los Angeles, CA; the Walker Art Center, Minneapolis, MN; the Jewish Museum, New York, NY; the Museum Ludwig, Cologne, Germany; the Sprengel Museum, Hannover, Germany; the Dallas Museum of Art, Dallas, TX; and the Museum of Modern Art, Saint Etienne, France. He has exhibited extensively in galleries and museums around the world, including the Museum of Modern Art, New York, NY; Kunstmuseum, St. Gallen, Switzerland; the MMK Museum fur Moderne Kunst, Frankfurt, Germany; the Orange County Museum of Art, Newport Beach, CA and Galería Javier López, Madrid, Spain. His work will be included in two upcoming group exhibitions: Slough at David Nolan Gallery, New York, NY and N'importe quoi at the Musée d'Art Contemporain, Lyon, France. Matthew was a recipient of the Gottlieb Foundation Award in 2008. Please join us for a reception with the artist on Thursday, April 23, from 6-8pm. Gallery hours are Tuesday through Saturday, 10am to 6pm. For further information and images please contact Lauren Cicione at 646.336.7183 or info@geringlopez.com.